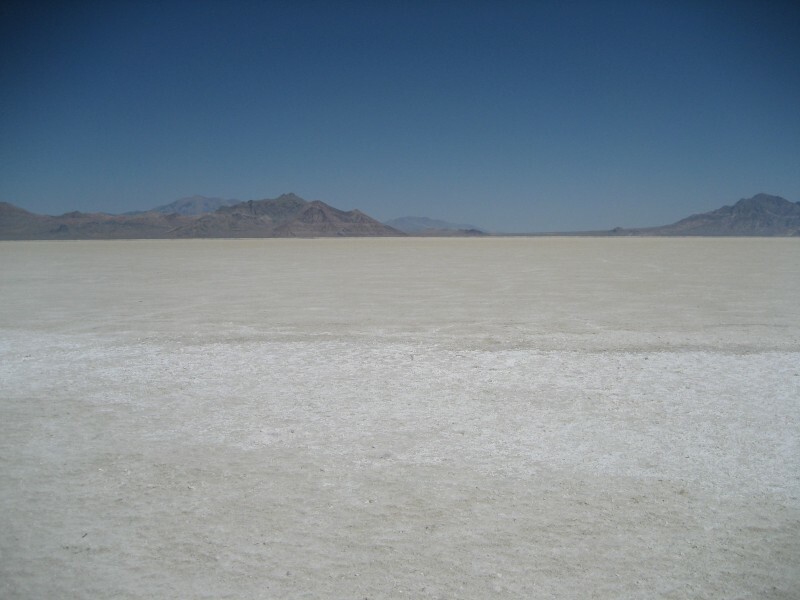 The Bonneville Salt Flats of Utah are globally famous as the site of land speed record events throughout history, due to the superior grounds of the flats. Frequently called the “Bonneville Speedway,” the flats have most recently been used by Denise Mueller and her team to break into the record books. 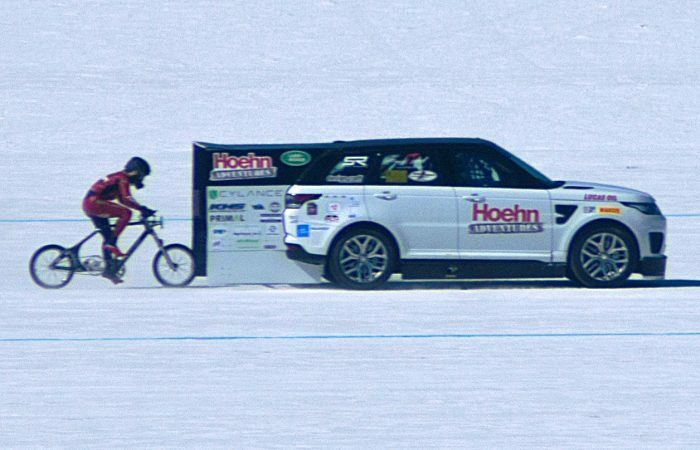 Denise Mueller is now the fastest woman to ride a bike, at an astounding 147 miles per hour. 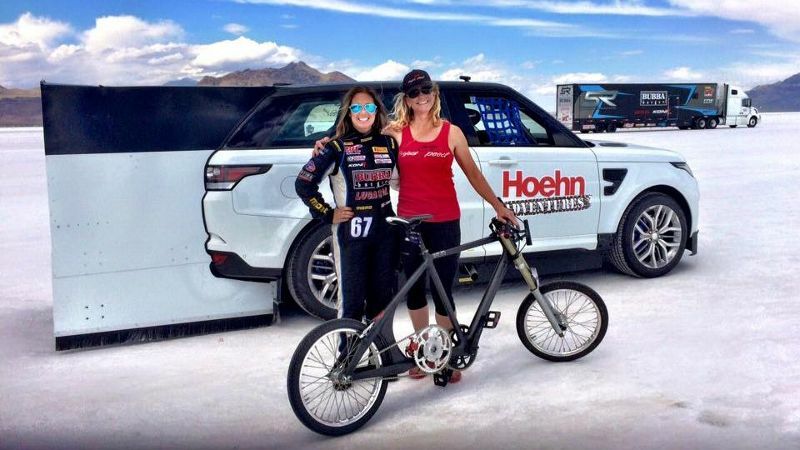 She set the Woman’s “Paced Bicycle Land Speed Record” as she drafted behind a vehicle driven by Shea Holbrook, a professional auto racer. With precision riding, just inches in front of Mueller’s front wheel, the team was able to punch a hole in the air in order to minimize wind resistance and increase aerodynamics for Mueller. For this record, cyclists are towed to a speed of about 90 miles per hour, then they are set free to pedal using their own power in the car’s slipstream. They must be towed because to break such a high speed record, a person could not turn the massive, single gear on the bike from a stand-still. 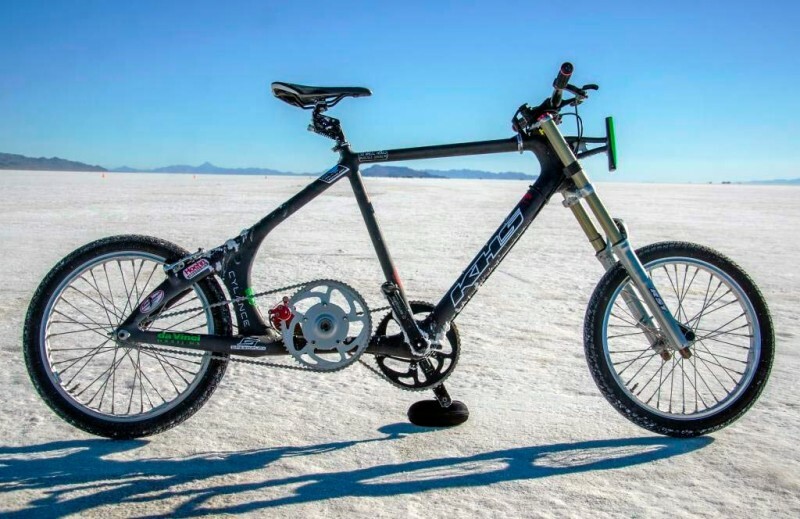 To accomplish such an extreme challenge, Denise needed a one of a kind, custom-made bike that would be perfectly suited to the Utah “Bonneville Speedway” Flats, insanely high speeds, and would be able to keep stable from potentially deadly wobbling at fast speeds. The custom-built bike Denise used was built by Chris Garcia of SD Wheel Works, with technical support by DaVinci Bikes and KHS Bicycles. With a range of technologies on board, this single gear enabled Mueller to maintain her stability as she rode and minimize wobbling at the high speeds she sought. All of this, while generating maximum power to blast to that 147 mph finish. Mueller, posing with her innovative, custom-made bike, next to her Pace Car. Mueller stated that the BodyFloat seatpost, which dampens harmonics and vibrations, ensuring a smooth pedaling and optimal traction at speed, was an incredible performance enhancer that helped her stay connected and smoothed her spin. This aspect allowed her to keep the bike very stable beneath her. Denise Mueller cited her desire to set such a record, by seeing men as early as the year 1899, setting record pace on bikes. She wanted to do something no woman has been able to do before in history, and show that women cyclists are just as capable as men. This “uncharted territory,” as Mueller told Women Who Cycle, is hopefully the beginning of giving hope to young female cyclists, showing them that girls and women are capable of amazing feats. 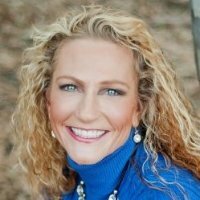 43 year old Denise Mueller of Carlsbad, California, has spent years of dedication and hard work to earn this brave record. And it does take bravery — this feat requires riding a single gear cycle on the Flats at 90 miles per hour, then with incredible power and precision, hitting the 147 mph mark. Blowing the competition out of the water, without injury, this is nothing short of incredible. With her nerves of steel, Denise has become a role model to all cyclists: young, old, boys, girls, and adult cyclists around the world. Mueller has every intention of topping her 147 mph record and beat her coach, John Howard’s old record of 152.2 mph. The Men’s World record is 167 mph and was set in 1995 by Fred Rompleberg of the Netherlands. Mueller’s coach and a men’s record holder, John Howard says that they need more track to beat the men’s record. “We’ve got four miles and we’d need six.” Hopefully the chance will appear and we can see what Denise Mueller has in store for the Women’s World Record once again. See our other articles, from news to reviews, below!